Origin and Habitat: Parodia ampliocostata dwells in the Cordillera de los Altos, on the northern border of the Paraguarí department, Paraguay. Habitat and ecology. Parodia ampliocostata grows between large granite boulders. Parodia schwebsiana var. applanata Werner Hoffm. & Backeb. Notocactus grossei var. aureispinus (F.Ritter) S.Theun. 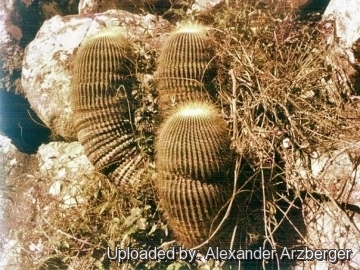 Description: Parodia ampliocostata, also known as Eriocactus ampliocostatus, is a local or morphological form of the very variable Parodia schumanniana (syn: Notocactus schumannianus), but not sufficiently differentiated and considered merely a local variant of the latter (if not the same). 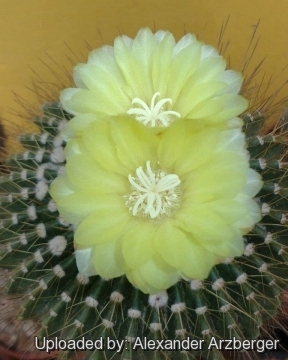 The key difference by which the two were separated, namely the presence of a higher number of ribs, larger rib height, higher spine number, different spine colour, multiple central spines, of which the lowest one conspicuously longer and pale yellow anthers, appear to fall within the natural variation of Parodia schumanniana and it should be synonymized with the latter. The following description of this species is based on Eriocactus ampliocostatus F.Ritter 1979 sensu stricto (Collector's number referred here is FR 1182). Stems: Cylindrical up 1.80 m long and 30 cm thick. Ribs: 32-48, about 10 mm hight. Marginal spines. about 5, gold or brown, later brown or grey, the lower pair up to 10 mm long, the uppermost unpaired, ca. 7 mm long or shorter. Central spines: 3 (-4) the upper two ca. 10 mm long, the lower one up to the 3 cm long. and 6-8 mm wide. Stamens pale yellow, 5-10 mm long, the lower upright, the upper bent inwards. Anthers pale yellow. Style light yellow, about 17 mm long, stigma-lobes 10-12 pale yellow ca. 6 mm long. 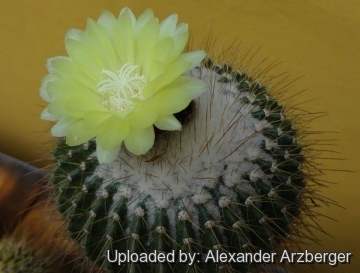 Seeds: Dark brown, a little smaller than in Parodia schumanniana, about 0.7 mm long, bell-shaped. Parodia ampliocostata (F.Ritter) F.H.Brandt: has more ribs, more spines, multiple central spines, of which the lowest one conspicuously longer and pale yellow anthers. Distribution: Cordillera de los Altos, Paraguarí, Paraguay. Parodia grossei (K.Schum.) F.H.Brandt: has stems to 1.7 m high and 30 cm thick, 3-7 long bristly white (or brownish) spines the longer one 4 cm long. Distribution: between Carepegua and southeast of the Cerro Acahay, Paraguarí, Paraguay. Parodia grossei var. 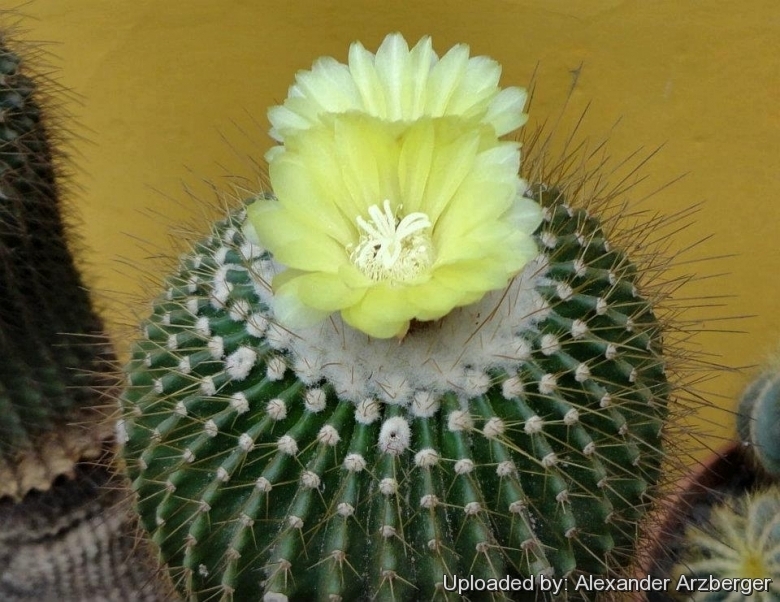 aureispina (F.Ritter) F.H.Brandt: has stems to 1 m high and 20 cm thick, 8-11 long bristly golden yellow to reddish yellow spines the lowest the longer. Distribution: Cerro Acati, Colonia Indipendencia, Depart. Guairá and Cerro Pelado near Villarica. Parodia schumanniana (Nicolai) F.H.Brandt: up to 1,8 m tall, areoles 7-15 mm apart, and 0-1 central spine. Distribution: Paraguay and north-eastern Argentina. Parodia schumanniana subs. claviceps (F.Ritter) Hofacker & P.J.Braun: less than 50 cm tall, areoles only 3-4 mm apart, and 1-3 central spines. Distribution: Rio Grande do Sul, Brazil. Cultivation and Propagation: Frost Tolerant as low as -4°C (or possibly colder) but in cultivation it is best to avoid any frost when during the winter the temperature can go down to 2° C without any harm so long as the compost is very dry. During the summer it is best to keep the plants outside where the temperature can rise to over 30 C with no harm to the plant. Allows good drainage and use a an open and free draining mineral compost that allows therefore roots to breath. They like only a short winter's rest and should be kept almost completely dry during the winter months, If the soil is allowed to be dry for too long root loss could follow but equally the same result would occur if the plants are both wet and cold. From March onwards the plant will begin to grow and watering should be increased gradually until late May when the plant should be in full growth. Need full sun avoiding only the harshest summer sun, if kept too dark they may become overly lush and could be prone to rotting due to over watering, they will also be shy to produce flowers. Repotting should be done every other year or every three years, annual potting is not necessary. Do not be tempted to over pot as this will cause the unused compost to go stagnant and you may loose the plant. Propagation: Seed sowing and cuttings.